One type of cuisine I can honestly say that I never tire of is Mexican. The flavor combinations are just incomparable, and I am always in the mood for Mexican food. Like, ALWAYS. Now with all the fantastic changes in the new Weight Watchers Freestyle plan, there are so many zero Point foods that can be used to create incredible, filling, mouth-watering recipes, without using up a lot of those precious Points. 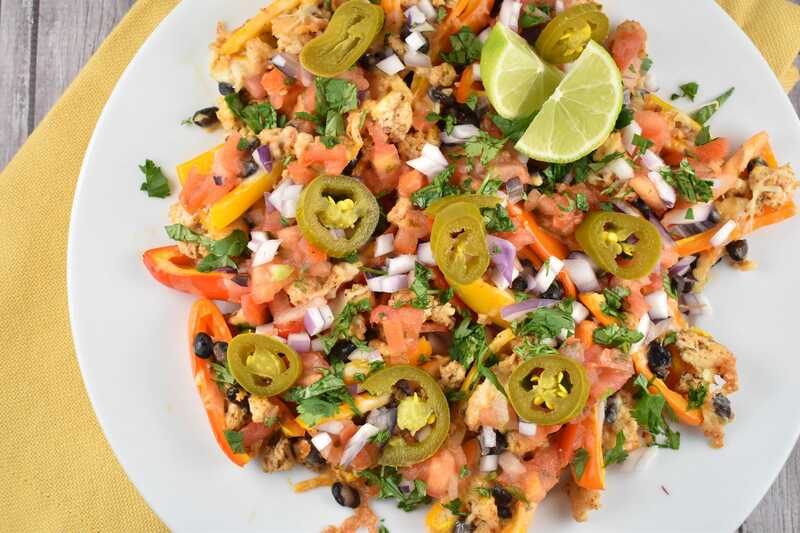 Case in point – this rockin’ Mini Bell Pepper Nachos Recipe. Not only is this nachos recipe a lot lighter than traditional nachos, it’s also, dare I say, healthy. The magic here happens by replacing the high carb, high fat tortilla chips with fresh, light, and nutritious mini bell peppers instead. Pure genius. I used ground chicken breast and black beans, both of which are zero Point foods, and sauteed them with some flavorful Mexican spices, fresh garlic, and onions. The seasoned meat and bean mixture then gets spooned into the bell pepper “boats”, topped with shredded cheese, and then quickly baked to melt the cheese and make everything a hot, melty, mouth-watering masterpiece. As an extra bonus step of deliciousness, I went ahead and drizzled some of Trader Joe’s Queso Dip over the nachos. That’s right. Queso. Oh yes, I did. Chile con queso simply referred to as queso, is an appetizer or side dish of melted cheese and chili pepper typically served in Mexican restaurants as a dip for tortilla chips. It is often made with processed cheese, such as Velveeta. Queso is actually the Spanish word for cheese, but in the US, it is often used to refer to this cheese-based dip. In case you missed my Instagram post, Trader Joe’s makes a jarred queso that is crazy low in Points. Just 1 Point for up to 5 tbsp! What!??!? Yeah, you need to try it. Once you’ve got the nacho “base” ready, now you can go crazy with all your favorite toppings! I adore fresh cilantro, so I topped mine with that, my homemade pico de gallo, fresh red onion, and pickled jalapenos. If you have a few extra Points to spare, sour cream and guac are always welcome too. But I’m sure you are already planning your own topping list in your mind as you read this. You guys, these mini bell pepper nachos are a game-changer! They make a perfect Super Bowl Sunday recipe, or for any game time grub for that matter. But they are so good, you’ll find yourself whipping up a batch for lunch or a guilt-free late snack on a very regular basis. Though this recipe is technically 4 servings, I will sometimes make the whole thing and share it with just 1 other person. No shame in my game, folks. This low carb nacho recipe is a game changer! Enjoy all the amazing toppings of traditional nachos, served atop light and nutritious mini bell peppers instead of tortilla chips. Preheat oven to 400 degrees. Line a large, rimmed baking sheet with parchment paper and mist with cooking spray. Place all mini bell peppers in a single layer on baking sheet. Place them cut side up and close together. Heat a medium, nonstick skillet over medium heat. Spray with oil. Add in garlic and onions. Saute for about 2 minutes. Then add in the chicken, cumin, chili powder, salt, and pepper, and cook until chicken is browned and completely cooked through, about 5-7 minutes. Stir in black beans and lime juice. Spoon ground chicken and bean mixture into the bell peppers. Sprinkle evenly with the Mexican style cheese. Place in oven and bake for about 8 minutes, until the cheese is melted. Remove from oven and drizzle the queso dip over the top. Return to oven for another 2 minutes to heat the queso. Remove from oven, plate, and top with fresh cilantro and any other desired toppings.